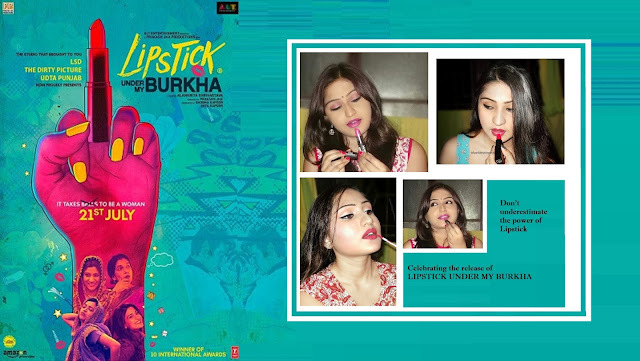 When I first came to know about Alankrita Shrivastava’s Lipstick Under My Burkha I was excited . 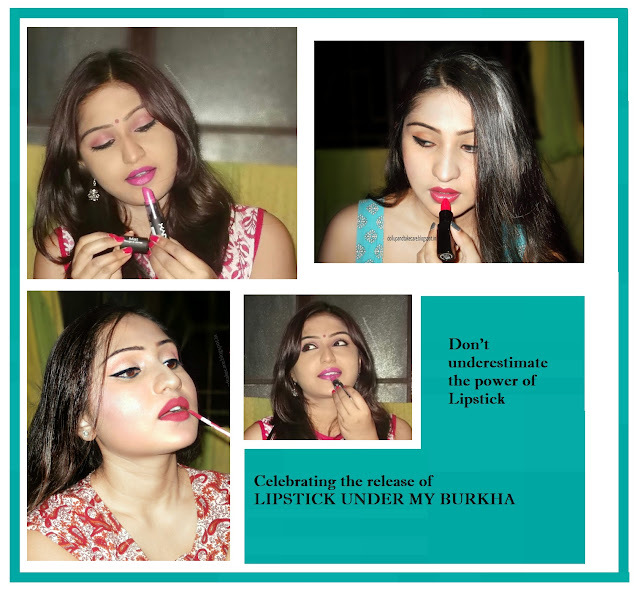 As you all know the word ‘lipstick' itself excites me like crazy . I must say after watching the trailers my initial interest was generated … but the official poster literally was enough to win my heart . I cannot describe in words how much I was inspired and moved by the official poster . The symbolic reprentation and signfying the same with lipstick design literally impressed me … And offcourse yellow nail paint .. it is feminine and positivity generating at the same time . Being a 90’s kid I always loved listening to F.M I remember listening to a color therapist on A.I.R F.M rainbow… they say if you use a yellow colored table cloth for study table it attracts positive energy and results in hike in concetration … I am not sure about the concentration factor, but I would definitely say postivity has a strong bond with yellow … so when I saw yellow nail color in the poster,memories of those color therapy days flashed in my memory . I must say the word ‘ lipstick ‘ attracted my attention not only because I am lipstick lover . But ‘Lipstick’ itself is strong steaming member of the brigade that stands for feminism . Yes I know I am sounding a little dumb ..when I am saying this . Truly if we plunge into the topic a little deeper ,we can actually conclude that lipstick itself is a symbolic representation of advent of change . 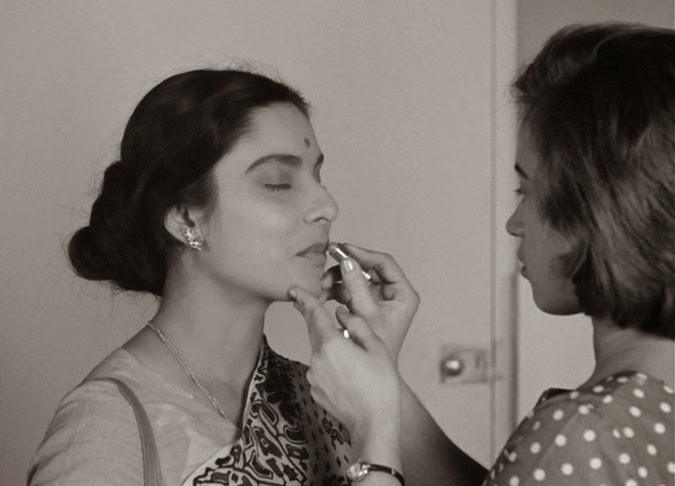 Satyajit Ray, notoriously known as the ‘Renaissance Man‘ of Bengal is one of the gods that Bengali film buffs worship.Ray too used the same thing ‘Lipstick ‘ to declare the advent of change and rise of feminism in 80s . 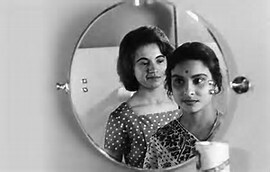 If you have seen the movie Mahanagar is based on Abataranika, a novel by Narendranath Mitra you must have already guessed what I am actually talking about . The film narrates the story of a housewife,Arati, who sheds her traditionalist family by getting a job as a saleswoman and hence breaking a number of gender roles. The comparison between the good, moral domestic woman and the immoral Westernised woman is also quite stark. 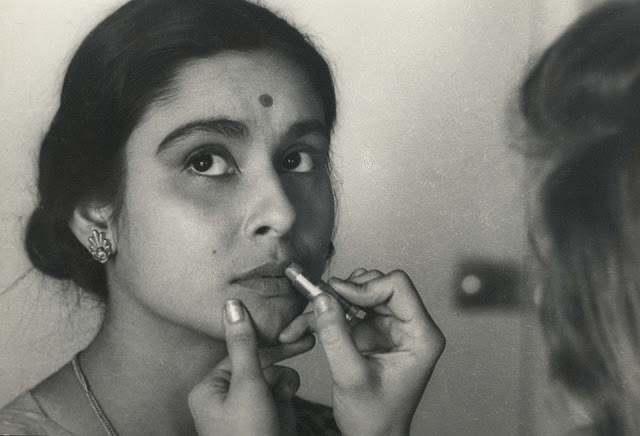 Ray uses the character of Edith (Vicky Redhood), an Anglo-Indian woman wearing dresses and skirts who speaks fluent English and applies lipstick on her lips, thereby abiding by the beauty standards, to compare the good woman with the bad. Arati on Edith’s insistence applies lipstick while returning home from work, on a casual weekday. Arati’s husband, having lost his job and suffering from deep insecurities on seeing her questions her integrity and asks her to quit her job. The morality of the middle class is highlighted from the fact that there have been repeated attempts at containing the integrity of the middle class bengali woman. I am not comparing the movies , if you have felt that I am actually drawing a comparison I am extremely sorry . 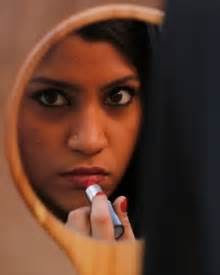 Lipstick Under My Burkha again narrates the story of a burkha-clad college girl struggles with issues of cultural identity and her aspirations to be a pop singer. A small town girl fighting cultural identity is supposedly pretty much deserving to earn herself a crown named strong ,adding to that making a career in pop music !!!! I would call her spirit “ Super Girl Spirit “ forgive me if I am overestimating .. Then comes the young two-timing beautician who literaly seeks to escape the claustrophobia of her small town. An oppressed housewife and mother of three, lives the alternate life of an enterprising saleswoman. Finally comes like storm , a 55 year old widow rediscovers her sexuality through a phone romance. Trapped in their worlds, they claim their desires through secret acts of rebellion.I am not comparing Ray’s movie with Alankrita’s at all. But it is amazing to see Lipstick as symbolic representation of change and feminism .. We do not necessaritly need to to be strong like a man to embrace change and stand for ourselves and actually ditch the “ log kya kahenge “ thought . People did not come to see you when you literally cannot sleep at night ,indulged in deep thought and planing how will you manage the expenditure of the last few days of month . People did not buy you the pills you take to cope up with depression . People exist to defame your desire ,that is not your falult rather it is natural . I know I am gonna sound super lame if relate to a dialougue from ‘Jungle book’ During the climax Mowghli was thinking of using his wolf trained skill ,when Bagheera adviced him to stick to his natural self and said “ Fight like human” …that’s what this concept is all about to embrace women empowerment fight like a woman not a man . You do not need to dress ,fight and protest like a man you can stand for youself having sticking to your natural self . If you flaunt your feminity you are not being wimpy or ridiculous ,rather you are celebrating yourself . 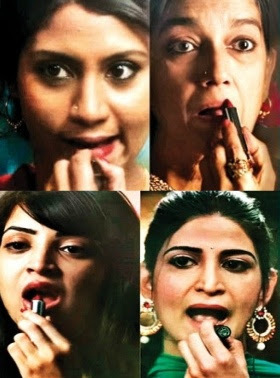 The offocial poster of Lipstick under my burkha literally preaches the same . If your independence makes someone insecure let it be .It was never your problem and it should never become one . 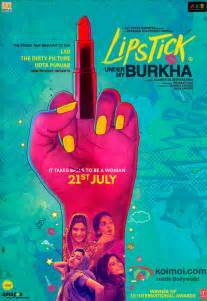 I wish all the success to Lipstick Under My Burkha Team ..I wish beside the awards the movie also makes huge success in box office . I am pretty excited about the this movie releasing on 21st July 2017 ...what about you all ?